Vegan Roasted Corn Potato Soup, a simple plant-based take on classic creamy corn chowder. 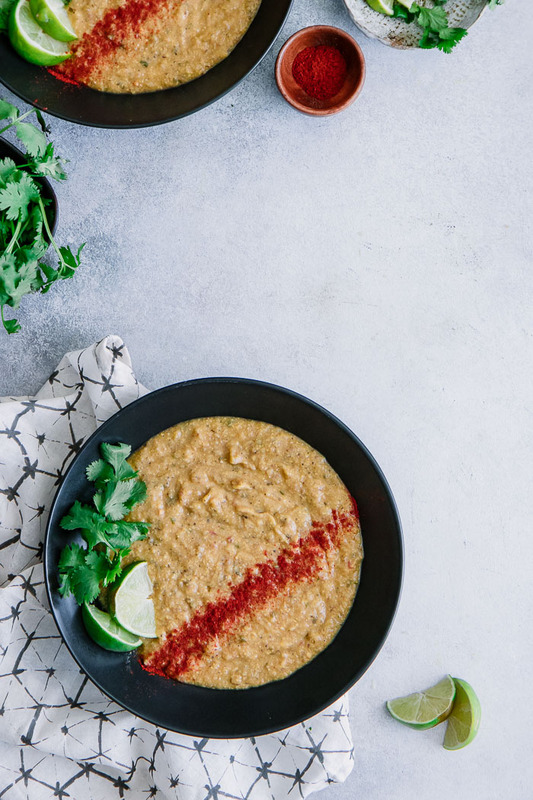 Made with corn and potatoes, and topped with spicy chili oil, this is a perfect spicy summer soup recipe! You may be thinking that you can’t eat soup in the summer. I get it, it’s hot. It’s humid. You can’t imagine a warm meal on hot nights. But let me remind you it’s peak produce season and the cream of the crop, literally, is corn. Fresh white corn cut from the cob, roasted in a cast iron skillet and then blended into a soup with a few summer potatoes. And topped with chili oil, you CANNOT forget the chili oil! What soup am I referring to? This delicious (and simple!) 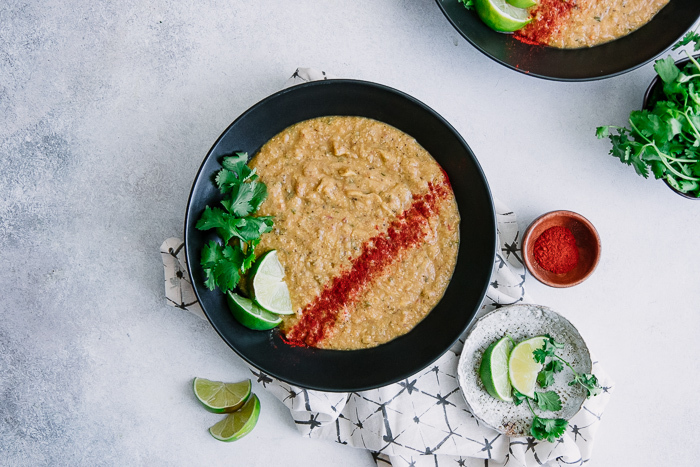 Vegan Roasted Corn Potato Soup, your new favorite summer soup. I was inspired to create the thick creaminess of traditional corn chowder but with only plant-based ingredients for the Vegan Roasted Corn Potato Soup recipe. The addition of potatoes adds the perfect texture and thickness to an otherwise thin liquid and gives this soup a creamy consistency. First you will cut the corn from the cob and brown in a cast iron skillet. Alternatively you can also use frozen corn, which you can heat right in the skillet without thawing (no fuss!). Then the potatoes, garlic, and onion are added to the skillet. When the vegetables have browned, transfer to a soup pot and cover with vegetable broth. Bring to a boil and then simmer on medium-low heat for 30 minutes. When ready to serve, top with your favorite garnishes (I love avocado, grilled corn kernels, or a fancy pico de gallo) and drizzle with spicy chili oil. A perfect summer soup that can be frozen and eaten as leftovers throughout the fall and winter. Cast Iron Skillet: No other pan gives food the nice browning that a cast iron skillet provides and the flavor from corn cut from the cob and roasted in a cast iron skillet is no different. I used a large Lodge skillet but if you’re looking for more variety I recommend this Simple Chef set. Large Soup Pot: I recently broke down and pot myself a large soup pot and I’m so glad I did – my usual Lodge pot is great but it was time to upgrade to a larger size. The wonderful thing about soups is that they are always better the next day when they’ve had time to sit and are great frozen and eaten days or even weeks later, so making a large patch will save you time and mean a more delicious soup in the future. A good chili oil: Try this good quality chili oil by Mantova, which we use and love. I hope you love this Vegan Roasted Corn Potato Soup as much as we do, it’s a summer weeknight favorite in our house. Looking for other plant-based soups? Try our late summer Favorite Roasted Tomato & Leek Soup and our autumn Pumpkin, Butternut Squash & Sage Soup. 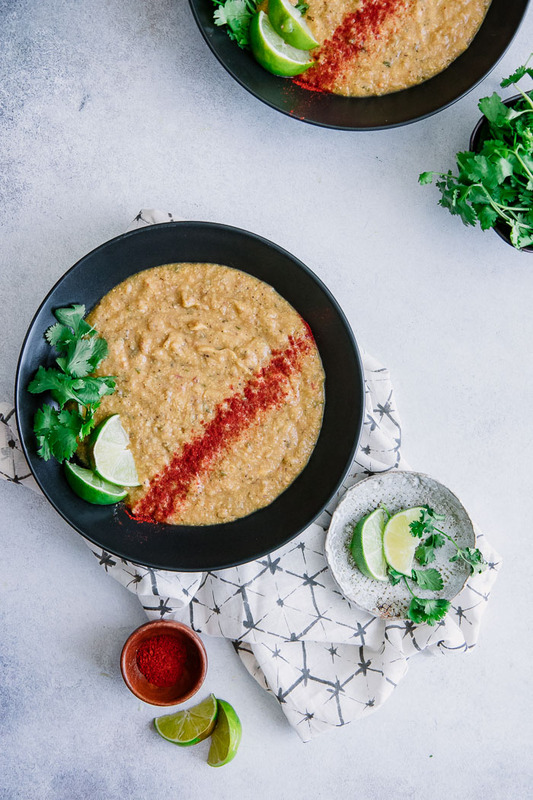 Did you make this Vegan Roasted Corn Potato Soup? Leave us a comment and recipe rating below to let others know how it turned out. Save this vegan corn chowder recipe for later by pinning to your favorite Pinterest board and make sure to tag me on Instagram so I can see your soup creations! Vegan Corn + Potato Soup, a vegan take on classic creamy corn chowder. Made with seasonal white corn, potatoes, and topped with spicy chili oil. Delicious! If using fresh corn, wash and shuck ears and cut corn from cob. Heat oil over medium heat in cast iron skillet or large pan and add corn, cooking until brown (about 5 minutes). Slice potatoes, onion and garlic and add to skillet with corn, cooking until vegetables begin to soften and become brown, about 7 minutes. Transfer vegetable mixture to large soup pot and add vegetable broth and bring to a boil. Reduce heat and simmer for about thirty minutes. Add salt and pepper to taste. Remove soup from heat and blend until smooth with immersion blender. Add additional spices, if needed, and top with chili oil before serving. The soup may need more or less vegetable broth, depending on your personal consistency preference. If you prefer a thicker soup then add only 3/4 of broth and add more if needed to desired consistency. Leftovers & Storage: This plant-based corn potato soup can be refrigerated for up to 4-5 days and frozen for weeks (or even months) and reheated. 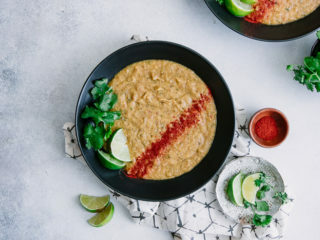 Nutrition: This Vegan Roasted Corn Potato Soup is a hearty meal that is high in plant-based proteins, fiber, vitamin C, and potassium. Do you peel the potatoes? No, you do not have to peel the potatoes. At the end you blend all vegetables together with an immersion or traditional blender until smooth, so there’s no need to peel…unless you just don’t like potato peels, then peel away! Thanks for commenting, I hope you enjoy!